Aquaponics is Louis and Nadine Kuys’s passion, and daughter Ellie already loves her greens. For years, Louis and Nadine Kuys toyed with the idea of producing their own nutritious food and living off the grid. This, however, was not possible on their 45ha farm on marginal land near Hopefield in the Western Cape. Finally, in early 2016, they sold the farm and bought a house with 1ha of land in the small town of Vredenburg, closer to the coast. Here they decided to break new ground with an aquaponic farming venture. “We always wanted to do tunnels, but Hopefield is just too hot, so we decided to try urban farming because our market is all around us in town,” explains Louis. Louis has been researching and planning aquaponics systems since 2014. 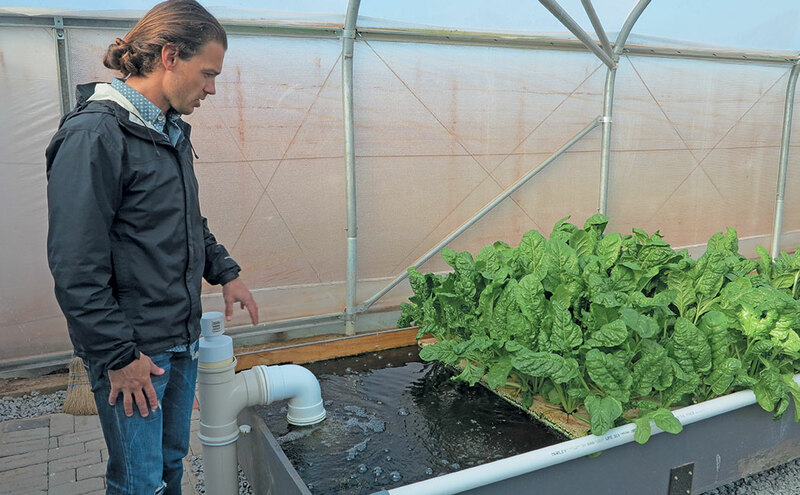 While investigating a new filtration system for a water feature, he stumbled upon the aquaponic concept, which is a system in which aquaculture and hydroponic farming methods are combined. After this initial venture, Louis felt confident enough to expand the system with a professionally built tunnel system. Forest Friends Aquaponics was started from scratch with money that Louis earned while working as a sub-sea inspection coordinator abroad. Farm manager, Ju-wanh Anthony, manages the day-to-day running of the farm. Nadine has a full-time job at Eskom, but helps out on the farm as well. The farm produces a variety of leaf vegetables that are sold in colourful, mixed packs. They include green and red oak leaf lettuce, cos and butter lettuce, beetroot leaves, fennel, dill, wild rocket, sweet rocket, basil, spinach, Chinese cabbage, and pak choi. The 30m x 10m aquaponic tunnel system has four rows of rafts (grow beds), each 28m x 1,2m in size. “We plant densely, with around 36 plants/ m², which means we currently have between 3 000 and 4 000 plants in the tunnel,” Louis explains. As strong wind is a constant feature of the West Coast, the tunnel system has been designed to withstand wind speeds of up to 120km/h, he adds. While aquaponics is often perceived as complicated, Louis says that the system operates on very simple principles. Municipal water, which is pumped into a 5 000ℓ tank, is degassed using aeration to eliminate chlorine, as this kills both fish and bacteria. During the nitrification process that follows, the water’s pH drops naturally and has to be buffered to about 6,5 or 7 to enable the plants to absorb the nutrients optimally. “We use calcium hydroxide and potassium hydroxide to bring the pH back up to the desired level for the plants,” Louis explains. The actual production process starts with the tilapia in the tanks, which Louis sourced from hatchery owner, Nick James, in the Eastern Cape. The fish are fed high-grade fish pellets, which digest efficiently in the gut, he explains. The fishes’ waste is then broken down by nitrifying bacteria, initially into nitrites and subsequently into nitrates, that the plants utilise as nutrients. The waste is transferred to a filtration system consisting of a slotted clarifier that traps solid particles. Water flow is slowed down by changing the direction of flow. Water is transferred from the clarifiers to the plants in two steps. Firstly, sludge from the clarifier is piped to an offline aerobic mineralisation tank. Here, the solids are treated, mineralised and broken down by Nitrosomonas and Nitrobacter bacteria into simple, usable plant nutrients. These are then passed through a tank filled with ‘bio-balls’, whose surfaces are coated with bacteria. Naturally occurring Nitrosomonas bacteria convert ammonia into nitrites, which are then converted by Nitrobacter bacteria into nitrates, before the water is pumped to the plants. In the second process, the clearer water from the top of the clarifier flows into a tank fitted with nets that trap more particles. Bacteria on the nets also mineralise the particles in anaerobic process. The water then passes to a degasser that enables the gases present – ammonia, carbon dioxide and hydrogen sulfide – to escape from the water. After degassing, the nitrate-rich water is pumped into the raft beds from where it is taken up by the plants as nutrients. Finally, the filtered water is pumped back into the fish tanks and the process starts again. Tilapia, which keep the plants free of pests and the water clear of algae, are also kept in the rafts below the plants. Bloodworms, which occur naturally in the water and feed on algae, waste or other debris, are also consumed by the fish as food. Louis watching as fish tea is pumped into the deep water culture system as feed for the plants. The fish tanks are housed in a building with clear roofing and dark walls that retain the heat, aiding the metabolism of the fish. Louis plans to grow fruit trees in the area around the tanks, as these will absorb potentially harmful gases escaping from the tanks while helping to create a warm, tropical climate conducive to the well-being of the fish. The plants are grown organically and no chemical fertilisers or pesticides are used. Three pumps are used: one to move the water through the system and two to aerate the water. As the cost of electricity is high, Louis plans to install solar-generated pumps as soon as possible. He is also experimenting with black soldier fly larvae; these will feed on waste plant matter and, in turn, become fish feed. Although the fishes’ weight gain is slower with larvae, the cost of larvae is far lower than that of pellets, so Louis will mix larvae with the pellets to reduce overall feed costs. For now, however, he is not overly concerned about the growth rate of the fish, as they are not the main source of income. Louis admits that pests are present, but he is determined to avoid pesticides, even those that are ‘environmentally friendly’. Louis is keen to supply the local market, as this ensures that produce is fresher and cheaper. “We harvest in the morning and you can eat the leaves in salad for lunch. Initially, we didn’t even want to bag and label the produce, because we wanted people to pick their own vegetables right here! “We prefer working with smaller businesses, as it keeps things simple. So we supply the fresh fruit and vegetable market in Vredenburg, various restaurants, private people and an online produce shop. Phone Louis and Nadine Kuys on 072 215 2765, or email forestfriends01@gmail.com.